The tongue, as a digestive organ, is instrumental in helping the body with swallowing during chewing. The tongue is also responsible for the sense of taste and the formation of speech. This organ’s structural formation is actually simple - it is a large skeletal muscle that’s covered by a mucous membrane. The intrinsic muscles of the tongue make it possible for it to move up and down, and in and out. It may seem like the whole of it is found in the mouth, but in reality, only two-thirds of the organ is inside the oral cavity. The remaining one-third is situated at the back of the pharynx, attached to the hyoid bone. 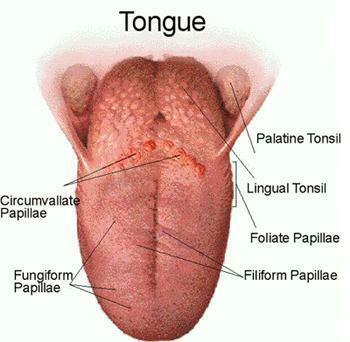 Rounded lingual tonsils line the superior surface of the base of the tongue. The tongue is able to hold itself against the floor of the oral cavity because of the connective structure known as the lingual frenulum. This connection is done at the mid-line and it’s attached to the anterior portion with the tongue meeting the mouth floor. Papillae, upraised masses, are found on the tongue’s surface. They help with the manipulation of food inside the mouth. There are three kinds of papillae, each having its service value. The one with the greatest number is called the Filiform, and it contains a very high sensitivity level. The Filiform is distinctive for its presence of tapered tips. It does not have taste buds. Vallate is the papillae which is noticeable for the V-shape that it forms along the tongue’s posterior section. Not greatly numbered, it is very sensitive to sour tastes and chemicals. The papillae known as fungiform is bigger than the Filiform, scattered haphazardly along the tongue, and more rounded.